When both ATI and NVIDIA launched their current generation video cards last year, both companies introduced a new anti-aliasing technique designed to improve the immersiveness of games requiring large amounts of anti-aliasing. However, with the introduction of these new techniques there is some confusion as to which manufacturer has got the best technique, and what the new modes actually add to your gaming experience. This article is going to require some prior knowledge of how anti-aliasing works and what it does to improve the quality of your gaming experience. If you're not up to speed on conventional anti-aliasing techniques that fall under the guise of multisampling and supersampling, we recommend that you give our guide to aliasing and filtering a read through. It covers the basics of anti-aliasing and filtering and you don't require much background knowledge to understand what's going on. This article is going delve a little deeper into anti-aliasing techniques and hopefully dispel the confusion surrounding the different transparency anti-aliasing techniques used by both ATI and NVIDIA. Normal multisampling anti-aliasing techniques only sample the edges of opaque textures, meaning that there are limitations to how much of the scene can be sampled by conventional methods. In simple terms, multisampling only cleans the edges of the polygons that make up the scene. Supersampling, on the other hand, renders the scene at a considerably higher resolution and then down-samples pixel samples to the required resolution. This costs a lot of performance and isn't practical in most scenarios. However one benefit of supersampling is that it does collect (and sample) every single pixel in a scene, allowing for optimum image quality. 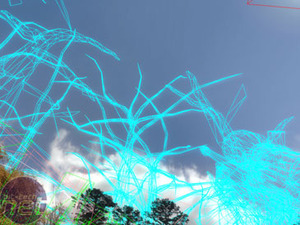 It would simply be too inefficient for game developers to replicate some effects with raw geometry made entirely of opaque textures and polygons. Also, anti-aliasing the scene would also be incredibly taxing, too. 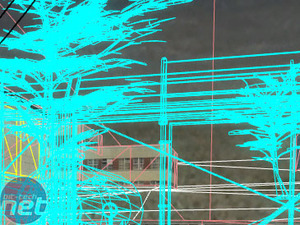 As a result, they often resort to using transparent textures to add more detail within the polygons that lay down the frame work for creating a realistic scene. This is where transparency anti-aliasing comes into play. Transparency anti-aliasing is essentially a complement to conventional sampling patterns. It works by anti-aliasing samples taken from within polygons where transparent textures are used to create effects that would cost too much if replicated with raw geometry. These transparent textures include objects like trees, grass and chain-link fences. However, their use isn't limited to chain fences, grass and trees - we're merely giving examples of where transparent textures have been used in recent games. Transparent textures are used when an object the developer is trying to render has some see-through areas, but is too small to be represented using polygons and opaque textures without suffering some quite large performance consequences. In order for the respective transparency and adaptive anti-aliasing patterns to detect textures that need sampling, the polygon must have alpha test enabled but alpha blend must be disabled. Alpha testing is basically a fancy term for transparent textures, as alpha tested textures are used to create geometry within polygons that isn't really there. Alpha blending is mainly used for creating terrain to blend two textures into one to increase detail (this is often known as displacement mapping). 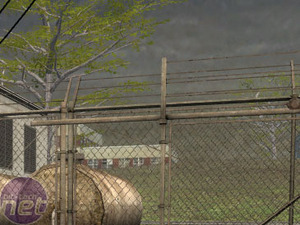 If you look at the two screen shots from de_nuke in Counter-Strike: Source, you'll see that the chain-link fences use completely transparent textures, as there is no trace of them in the wire frame shot. The foliage on the trees is also a transparent texture too. However, it's important to mention that all of the branches - no matter how small they are - are still constructed with geometry and opaque textures. The razor wires along the top of the fence are also assembled with the same conventional method. 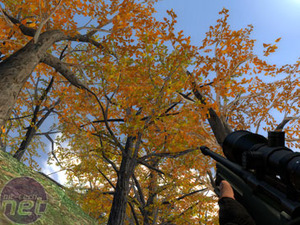 The pair of screen shots taken from the cs_militia map really show how much of the tree foliage is made up of transparent textures. In fact, only the major branches of the trees are fabricated with geometry and opaque textures. When transparency anti-aliasing is disabled and you're moving through the woods on cs_militia, you really begin to notice aliasing on the foliage. It can become quite a distraction in the same way that texture shimmering can.